Up until I began taking home economics classes in eighth grade, I thought everybody around the country ate the same things my family did in Texas. Red beans, cornbread, chicken fried steak, fried chicken, barbecue pork, black-eye peas and turnip greens were our standard fare for supper or Sunday dinner along with grits, biscuits, and flapjacks for breakfast. That year I learned about different foods from all over the country, and more about foods from different cultures. I did know some about German because my grandmother cooked Sauerkraut and a German Fruit Cake for my grandfather, but I never thought much about them except that I hated the Sauerkraut, especially since she made it from scratch. The discoveries in those cooking classes led me to major in Home Economics at Baylor in the ‘50’s. There I found all kinds of good foods from all over the world. Research for my historical novels also led me to some interesting finds. Because my newest release is set in the days of plantations and southern living, I did quite a bit of research into foods of that time. Southern cooking, like Southern hospitality has become a legend that is partly truth and partly myth. Not every plantation had good cooks and not all plantation owners were hospitable hosts. Still, every region from Maryland to Louisiana has a rich tradition of culinary lore. Corn and pork were staples of the diet. Ham was a favorite, smoked right on the premises. 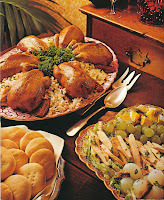 Chicken was another favorite and used in everything from main dishes to salads. 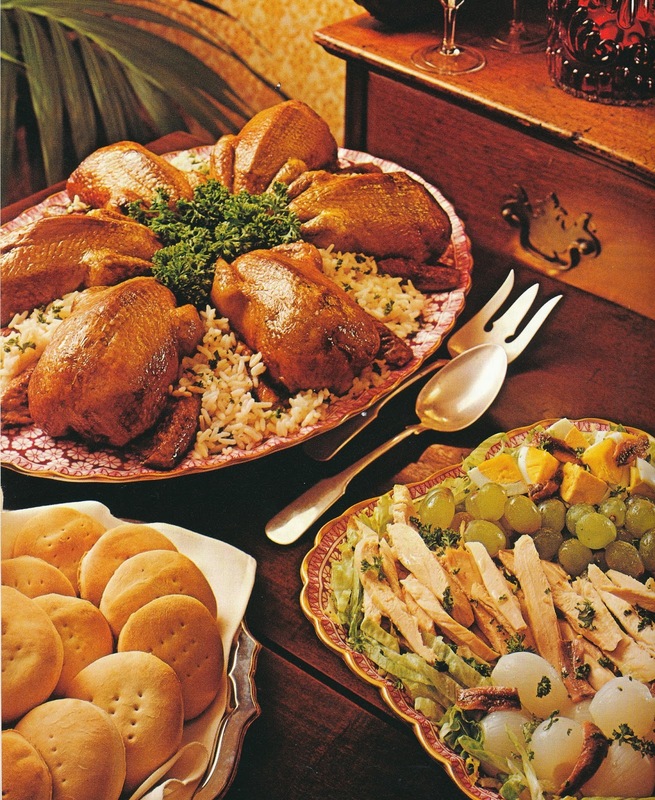 This picture depicts a mid-day dinner of chicken with oyster/giblet dressing, beaten biscuits, and Salmagundi. During the war, foods became scarce as supplies were limited to what they had on hand. Cooks had to improvise in order to satisfy the appetites of the family. Sometimes they would even boil the dirt from smokehouses to get the salt, and they made soda from burnt corncobs. Sweet potatoes were easily grown and used in all sorts of ways from vegetable side dishes to desserts that birthed Sweet Potato Pie. 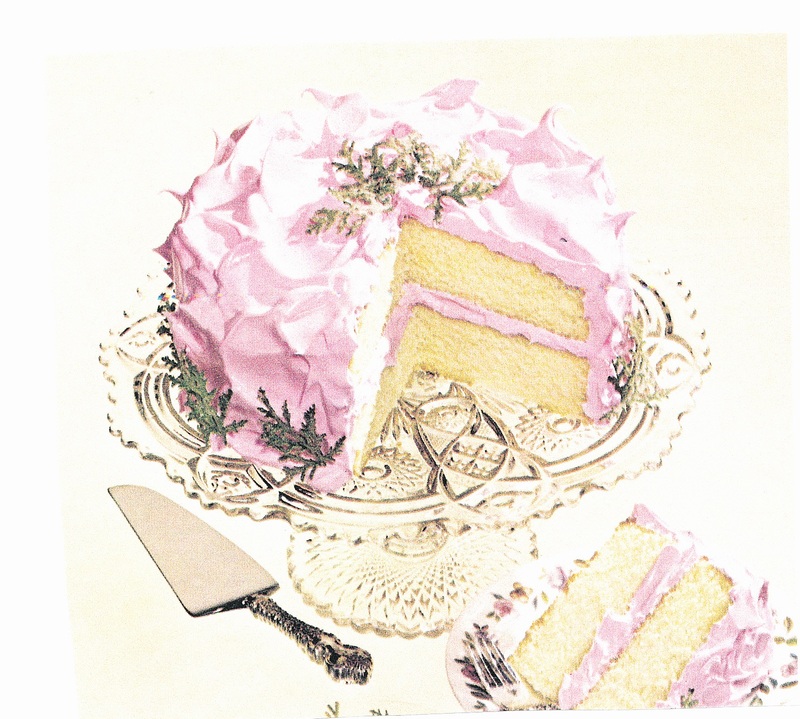 This Rose Geranium Cake came about as a result of the shortage of various flavorings and seasonings. Rose geranium leaves were used as a replacement for more common flavorings such as vanilla or almond. If you ever ate a Mock Apple Pie made with Ritz crackers, you may be surprised to learn that it had its origins during the Civil War when cooks used cheese crackers instead of apples. They made a syrup of sugar, water, cream of tartar, lemon peel and lemon juice. The syrup was poured over the crackers in a pie shell and sprinkled with cinnamon. Then dollops of butter were placed on the mixture before adding the second crust. Remember everything cooked started with natural ingredients, many times women were in the kitchen most of the day preparing the foods for the meals to be served. In many cases, eggs had to be gathered and cows milked before breakfast, and a trip to the smokehouse was in order if they wanted smoked meat for a meal. No quick trips to the grocery store for forgotten items unless you lived in town with a good general store close by. Do you have any recipes handed down in your family? If so, share them with us. I'm compiling a list of all my grandmother's recipes to give to my cousins. 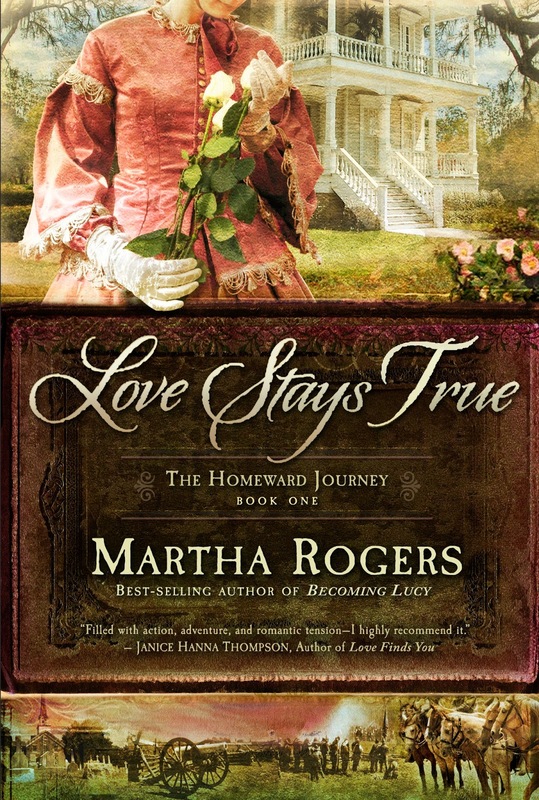 Love Stays True takes place immediately after the Armistice in 1865. It is the story of Manfred's journey from Pt. Lookout, Maryland and a prison camp to Louisiana. While he traveled, Sallie waited for him and endured some painful experiences that molded her into the woman who would become a doctor's wife and travel to Texas to help him set up practice. Martha started late in life but now has multiple novels and novellas in print. She lives in Houston, Texas with her husband and is active in their church where she sings in the choir and teaches a class on Sundays and he serves as a deacon. 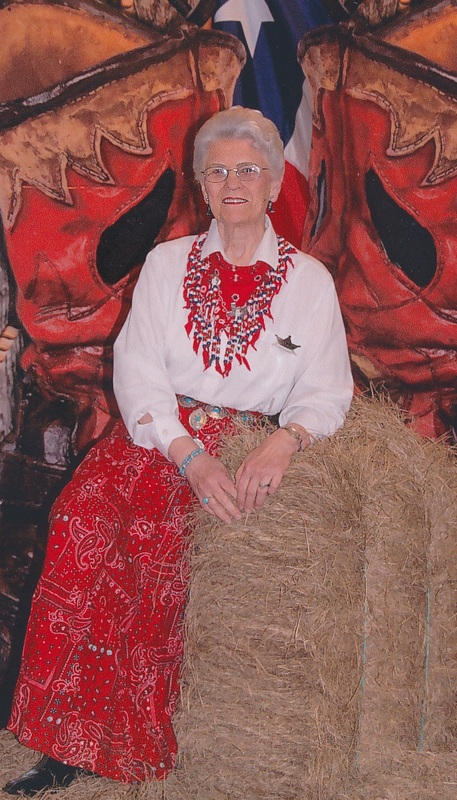 She is a member of ACFW, The Woodlands Chapter of ACFW: WOTS and IWA! She is a regular member of the faculty for the Texas Christian Writers Conference held in Houston each August. Leave your comment for a chance to win a copy of this book. Don't forget to leave your email address and answer the question above. The winner will be announced on this blog on July 12. Thanks for dropping by. I made a family calendar with pictures of all of us on the different months . I also included a recipe from my Mom on every month. A favorite is FLUFF- 1 container CoolWhip, 1 container cottage cheese, 1 package dry jello powder. Mix all together till blended well. Add fruit- canned is best- and blend in. I love this recipe. I change the color of Jello for the season and my family loves it. It can be a salad or a dessert. I enjoy reading books set in the old South. Thank you for the chance to win. We have a couple of recipes, one is lasagna and the other is runzas. I don't have the recipes off the top of my head though. Angela, this is the first time I have heard anyone mention runzas! I got the recipe out of a cookbook one time and my husband and I love them, but no one else seems to have heard of them! No really great or memorable cooks in my family. When my sister married my brother-in-law did introduce us to some foods from his side of the family (German). Martha, you have my mouth watering. The only recipe I have that was passed down was one I got from my aunt Mildred. She made this "pink stuff", which I loved. It's not too old because it contains a bottom layer of vanilla wafers. Then you slice bananas and lay them over the cookies. Mix a box of strawberry jello, small container of Cool Whip, half cup sugar, a can of crushed pineapple, and marshmallows. Mix that together and then spoon it over the cookies and refrigerate. It's yummy! Martha, my mouth is watering. I remember as a child visiting the south and thinking I was in a different country. My family cooked by "feel" and never wrote down a recipe. I wish they had. The recipes I have of my grandmother's were not written down anywhere either. She taught me to cook when I was six years old and I remembered what we did for pie crusts, cakes and cookies and then when I was older and majored in Home Ec, I followed her through the kitchen and wrote them down. Otherwise they would be lost. My dil did the same with me for recipes I "just make". :) When we went to New England, I felt the same way. I have a recipe handed down from my grandmother that is German. We ate it growing up. Not sure that the spelling of the name is correct - Irmiscle. 1 1/4 c. flour, 1 1/4 t. Baking Powder, 1/4 t. salt, 3/4 c. milk, 2 eggs, slightly beaten, 2 T. melted butter or shortening, 1 t. sugar. Fry all batter at once. Turn, cut in strips and chop. Serve with warm blackberries with plenty of juice. Hmm, sounds good. My grandfather was German and Mimi made a German Fruit Cake for him that was so good. It used jams instead of candied fruit. I love Christine mentioning the Peanut Butter Pie....a favorite. I could start listing all kinds of handed down recipes....but I need to find them...somewhere around here! Thank you for this wonderful giveaway and the chance to win a great gift! I would have to say Tuna Loaf, you NEVER hear about tuna loaf, and most people don't like it. It's almost like a stuffing, just bread, tuna, a little milk and mix till the bread is moist and bake. When serving each puts lemon juice on to taste. I have even put peas in it sometimes. I have all my grandmother's and my mother's recipes. I'm trying to make a family cookbook. A couple of favorites are Cranberry Relish, which is so quick in the food processor, but the old-fashioned way required a food grinder--crank-type. Gramma always made Date Roll for holidays. 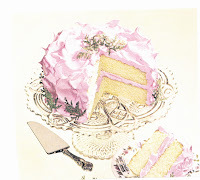 It is a heavy cake baked in tall round cans and served with a decadent Butter Cream Sauce. Oh, Kay, I remember my grandmother Mimi making those date rolls. They were soooo rich with that cream sauce. My grandmother Mammy taught me to make the cranberry relish with a food grinder also. You're right, the blender is much easier. Thanks for stopping by. Congratulations to Tamara. You're the winner of a copy of my book. I'll be contacting you by email. Sure hope I'm not too late for the drawing. Computer has been after getting out of Hospital . anchovy. I would have to make changes in these recipes. No oysters or anchovy for me. LOL I don't have recipes from down through family. I would love to win your book.